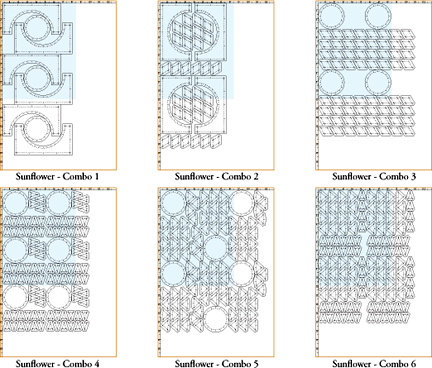 Templates to print on fabric for Sunflower quilts. This is a WOW design that will impress your friends, especially because it is a design which cannot be paper pieced. You don't have to tell them how easy it is with Inklingo, but we hope you will! Inklingo makes it possible to take a simpler approach to Sunflower designs—without templates! Chain piece by machine or do "continuous stitching" by hand. See why quilters love Inklingo for Sunflower and New York Beauty. New York Beauty is a variation of Sunflower, so it is included here. The Gallery of Quilts and the 26 worksheets in the design book will inspire you! Follow a traditional pattern or get creative and combine both sizes. 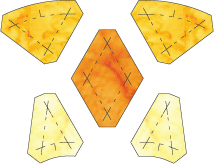 Diagrams for each Inklingo shape make it simple to decide how much fabric you need whether you are using scraps or yardage. 5. Double Sunflower with Two Sizes! The sizes were chosen to work together, so you can make stunning, unusual Double Sunflowers! SAVE with Double Sunflower! This outstanding design is possible with the 6 and 12 inch Shape Collections. Buy both on the same order and Monkey and I will deduct an extra $5 from the total manually! Please remind me in a comment on the order. 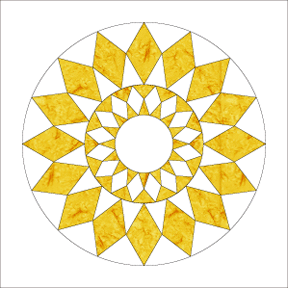 In the Double Sunflower above, the inner and outer yellow triangles, the inner and outer white triangles, and the white circle and diamonds can be printed with combo layouts. It saves time and fabric. Very cool. Inklingo really is the quilting tool we've always wanted. Monkey says you will love the way these blocks press.